Kensington was a suburb of London when William III moved into Kensington Palace, which until then had been a minor vacation spot. William III had respiratory problems, and the poor air of London made it hard to breathe. Although Kensington has been around at least since William I commissioned his Domesday Book survey in 1086, it has gained fame first as the primary residence of Queen Victoria (reigned 1837-1901) then as the residence of Diana, Princess of Wales (d. 1997). 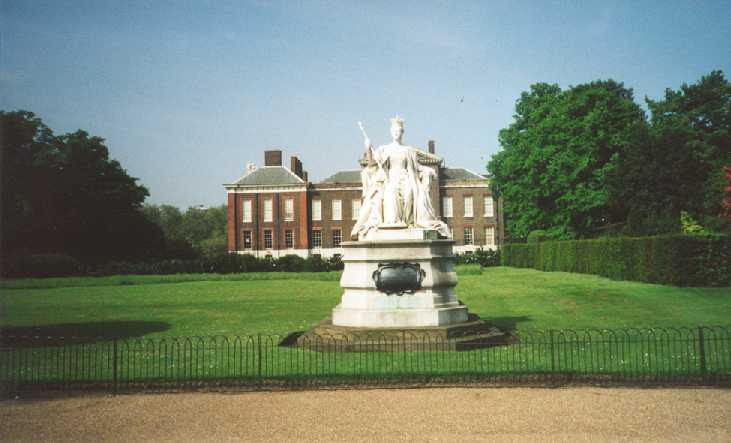 When we were in London, we stayed about 3 blocks from the Palace and the surrounding park and gardens. 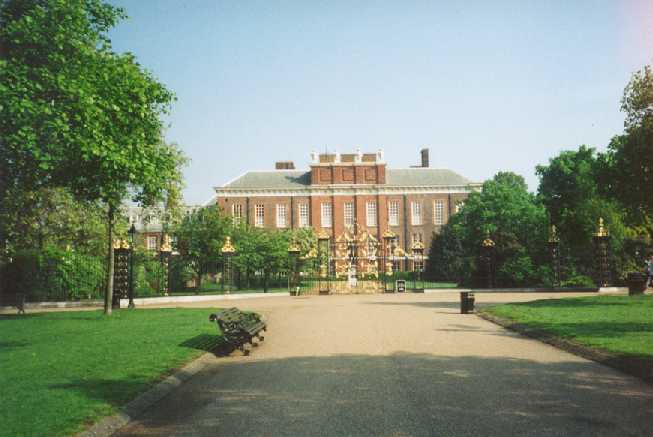 Check out http://www.hrp.org.uk/ to see the official site of Kensington Palace. 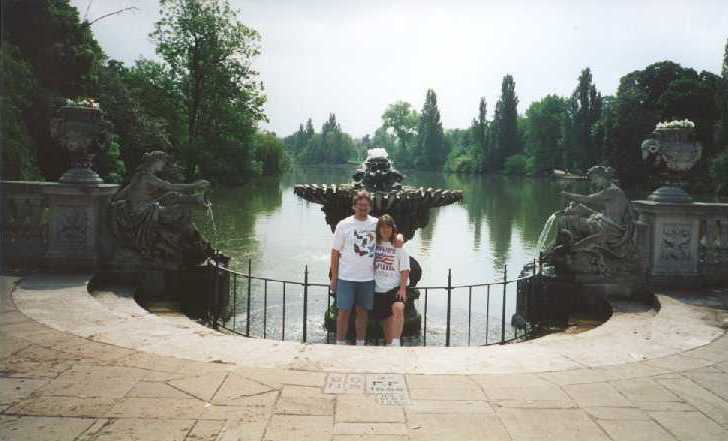 This is me and Debbie in front of one of the many fountains in Kensington Park. The palace is surrounded by a large public park, and many gardens. This is part of Kensington Gardens. 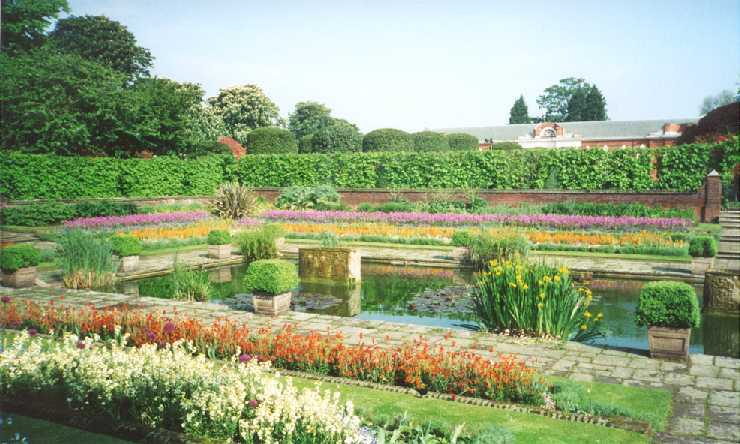 According to teh sign outside the garden, this was a favorite spot of Princess Diana before she died. This is the main entrance to Kensington Palace. This is one of many places that mourning British people put flowers after Princess Diana was killed in a Paris car crash. Kensington Palace was the birthplace and home of Queen Victoria, who at 64 years was the longest reigning monarch in English history. It is said that when the 11 year old Princess Victoria was told that she would one day be queen, she started crying, saying she didn't want to be queen. After a few minutes however, she calmed down and said, "OK, I'm sorry I cried. I'll be good." 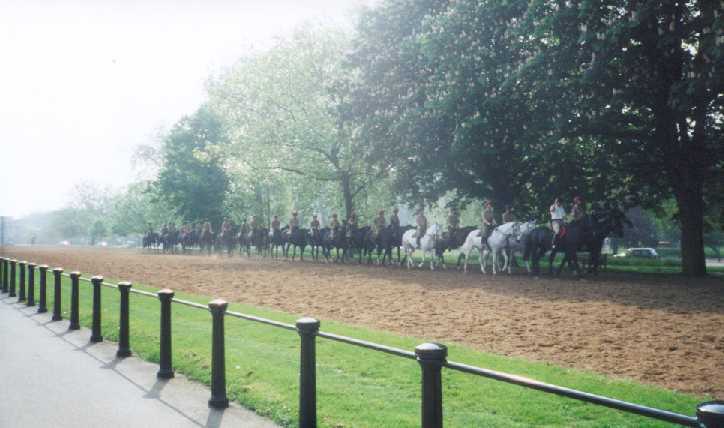 This is the riding track in Kensington Park. The track goes all around the inside of the park, and it is home to several riding schools.